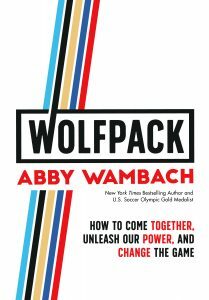 Abby Wambach | World-class Athlete to Wolfpack Activist. Abby Wambach’s name is synonymous with soccer. A two-time Olympic gold medalist, FIFA World Cup Champion, and the highest all-time goal scorer ever, she is an icon. But, that’s not the whole story. Not by a long shot. Retiring in 2015 at the age of 35, Wambach found herself, for the first time since she was a young child, without a defining identity or path forward. The year that followed brought her to her knees, but then delivered her into her next, even more powerful act of her life. She met and married the love of her life, Glennon Doyle, (who’s been a previous guest on this show) and became a parent to three kids. And, Abby decided to redirect the same fierce effort that led her to be a world-class athlete toward becoming an activist for equality and inclusion, a champion of women and human rights. Her new book, Wolfpack, and the movement and company she’s launched along with it, is a reclamation. It’s a call to agency and community. It’s a stake in the ground that defines this next, powerful leg in her journey, and her role in our collective journey together. We explore this powerful journey, along with many of the deeper motivations, struggles, moments of awakening, defining stories and so much more in today’s powerful conversation. Quip: QUIP starts at just $25 and, if you go to GetQuip.com/GoodLife right now, you’ll get your first refill pack FREE with a QUIP electric toothbrush. True Stories of Good People, a GoFundMe podcast: Listen and subscribe to True Stories of Good People on Apple Podcasts or wherever you listen. Don’t miss out on weekly updates, insider-invites, curated resources and ideas to help you live your best life. © 2019 Good Life Project. All Rights reserved. Disclosure & Other Legal Mumbo-jumbo: We love that you're enjoying the show and other cool stuff here. Our crack legal staff (a/k/a the cat) tells us we should let you know that you should assume the owner of this website is an affiliate for people, business (imaginary creatures, including but not limited to unicorns, elves, demigods and all manner of fairies) who provide goods or services mentioned on this website and in the videos or audio (or smoke signals). The owner (that'd be me, writing in the third person, but shhh, don't tell) may be compensated if you buy stuff from a provider. That said, your trust means everything to us and we don't ever recommend anything lightly (with the exception of when we're bribed with organic dark chocolate, because on those occasions anything goes!). Capisce! ©2019 Good Life Project. All Rights reserved. Inspiring stories & actionable ideas delivered weekly with a smile. Enter your email address below and access the Masterclass... it's 100% FREE! We respect your privacy and promise to keep your email address safe.